Night fell and the riders and horses got settled into camp. Picket lines and portable corrals were set up everywhere on the grounds of the beautiful Bridge Meadow Brook Farm Tyngsboro, Ma. and the night air, that crisp autumn air of October laced with a hint of woodsmoke and barbeque settled over us. Down by the pond and river riders began to gather and share in a trailside Barbeque to rival any westward expedition. The food was incredibly good and the company the best and the music began. Later into the evening I began to share stories having worked up some good spooky tales and horse stories to share with our cowboy friends. It was everything a night at the bon fire could be and then some, for the magic of that eve lingers with me now, several years later. Finally we all drifted toward our camping or night arrangements. My brother had come along with us hauling the horse trailer and we had set up a nice tent. It had been 30 years since I had camped out with my brother, how fun! 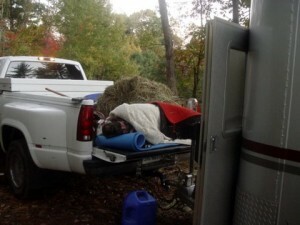 Tim opted to put his sleeping bag in the horse trailer to stay right next to his horse. Daybreak was secured to the side of the trailer with leads clipped to his halter a huge net full of hay and buckets of water. Just a couple feet away his partner layed out a sleeping bag where he could hear the munching of his horse and the busy day was quick to claim its reward of sleep. It was near midnight when I finally had finished prep for the morning and put away gear from the damp night air and run the long zipper of the tent and sleeping bag. I lay in the absolute darkness waiting for sleep to capture me and instead my eyes were wide and I realized just what a loud eater our Daybreak was. From the rip of a mouthful of hay from the bag to the minute or two of crunch and munch to the next rip. How incredibly annoying to be this tired and have to listen to that. My brother was long since stolen by sleep and his breath came quiet and slow. There were few sounds from camp an occasional stomp of a horse or the babble of the river passing through. The next thing I know I was waking from a deep sleep almost drugged feeling. So incredibly tired my body felt heavy and pressed into the earth beneath my sleeping bag. Glow face on my watch said it was 1 a.m. I had only been asleep less than an hour and I had to use the bathroom. I tried to forget it and go back to sleep. The lovely green port-o-let was a long walk down the dirt road, I was to tired, no I had to go now. I noted there is no quiet way to unzip a sleeping bag or a tent but neither woke my brother, he always has been able to sleep through anything, at the moment envy stole over me! Outside the tent I look into the darkness toward the road and decide to look at Daybreak first. I step around the truck and trailer and back, then jump back toward the trailer and look again in the darkness of 1 a.m. HE’S GONE! Down a long road over the bridge and on under such deep pines the stars are obliterested and I come to the path into the field where we spent the day competing. My eyes adjust to an increase in light, no horse, just the cars whizzing by so close on Rte 3 the State highway crossing from this northeast corner of Massachussets into New Hampshire, Oh God please no ! I could not envision our beautiful boy out on that highway and a panic rose up with acidic hands and clutched my pounding heart. (C) This ends part 1 I will be posting part 2 on Wed June 16 click on follow to be notified when the second half of my story is published.